There really is very little that can be said about Steve Vai that has not already been said. Suffice it to say that he is a half decent guitarist so the Ibanez JEM505 guitar that bears his name should be a pretty good guitar to play really. The JEM series of guitars was created by Ibanez in collaboration with Steve Vai and the series was originally launched in 1987. 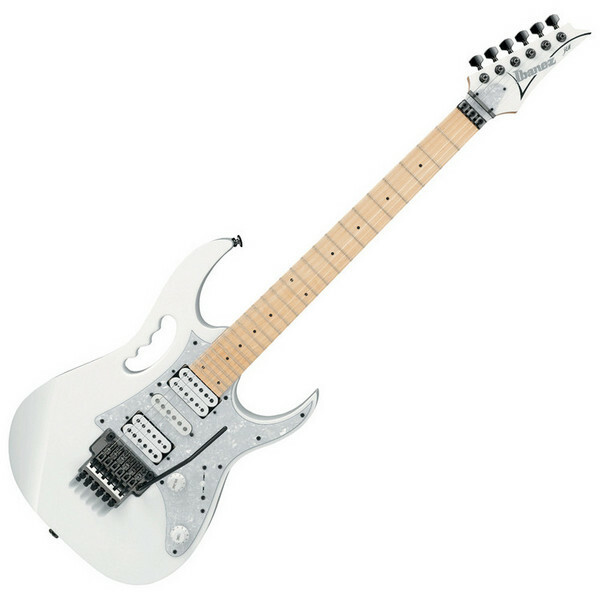 The JEM series, of which the Ibanez JEM505 is a part, promises to adhere to the exact specifications that Steve Vai uses and few signature models can boast that pedigree. There are five sub-models of the JEM: the JEM7, JEM77, JEM777, JEM555, JEM333, and JEM70V. Although the Ibanez JEM series is a signature series guitar, Ibanez mass-produces several of the guitar’s sub-models this includes the Ibanez JEM505. The Ibanez JEM505 is a quintessential Ibanez superstrat with all the features that we have come to expect from such a guitar. The body is made from Basswood and has two deep cutaways to allow easy access to the upper frets. The guitar features the now familiar through the body handle grip, reminiscent I think of an M16 machine gun. I have to admit that I really hate this feature of the guitar and this would sway me away from purchasing this guitar for purely aesthetic reasons, which is a bit sad I know. But hey I am shallow and looks are everything to me! Moving swiftly on, the neck is maple/walnut, has 24 frets and is beautifully finished with a thin profile for a super quick playing experience. On the Ibanez JEM505 we have the typical humbucker in the neck and bridge positions and a single coil in the middle position. For me the choice of pick-ups is ok if a little bit un-inspired being standard Ibanez fare. This might be a little bit picky but on such an expensive guitar you I would like to see something a bit more, well expensive! That said the sound that they produce is good and, through the 5 way selector switch, the pick-up combination allows for a lot of sonic experimentation. The Ibanez JEM505 is fitted with an Edge bridge which is a double locking tremolo system developed and produced by Ibanez and introduced in 1986. The Edge is very similar in design to that of the original Floyd Rose tremolo, although with some improvements, namely more overall mass and larger in size, locking studs, a spring retainer on the tremolo block and a pop-in arm. These features give a tremolo system that allows you to get quite physical without going out of tune. All in all the Ibanez JEM505 is a good guitar, well put together and with all the features that you would expect from a superstrat style guitar. It is not perhaps for me as I don’t like the handle grip design of the body. However, that should not detract you from what is a great guitar that plays extremely well. Furthermore for a short time Gear 4 Music are having a sale on this model so you can pick it up for an amazing £849 which is a whacking £926 off the list price. Maybe I should reconsider my aversion to the handle grip design! Worst guitar I ever purchased….Wanted the maple neck, so I thought I would throw out the worthless pups for evos! Didn’t know I would have to throw out the worthless guitar because it doesn’t come close to staying in tune!! What a waste of money…shame on Ibanez! !